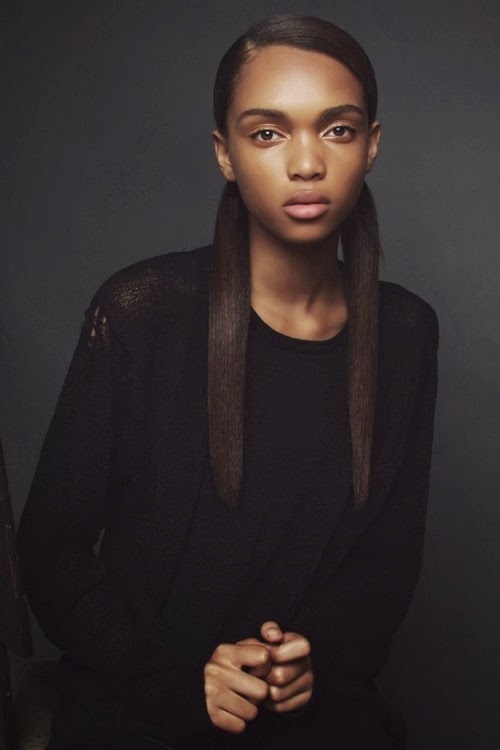 Seventeen year old Samantha Archibald was one of the standout newcomers that IMA encountered amongst the two hundred plus models in attendance at the Natalie Joos Casting for Spring/Summer 2014. With her willowy 179 cm frame, luxuriant caramel skin tone, and a spellbinding hypnotic gaze, it's no wonder IMA made a beeline to capture Archibald's beauty on film. Being the new kid on the block, Archibald initially comes across as shy and reserved but with a little encouragement it doesn't take long before her megawatt smile and youthful enthusiasm bubbles to the surface, charming all in her midst. Archibald displays the kind of rare beauty that would have even the most jaded of model aficionados jolted out of their somnambulant stupor. Archibald's perfect heart-shaped face, pillowy bee-stung lips, and adorable puppy dog hazel eyes call to mind the kind of drop dead gorgeous looks of actress Halle Berry. Watching Archibald in action as she walked for Natalie Joos, it soon became apparent that her fearless runway swagger would soon be gracing runways throughout the Spring/Summer 2014 season. Following a promising debut at the New York collections walking for Karen Walker, Charlotte Ronson, and Carmen Marc Valvo, Archibald gained momentum in London appearing at Giles and Sister by Sibling, before galvanising industry attention in Paris with a slew of runway bookings for Nina Ricci, Andrew Gn, Maxime Simoens, and Moncler Gamme Rouge. Archibald's combination of classic unadulterated beauty and graceful elegant proportions, combined with a serene runway composure show all the promise of true star in the making. IMA caught up with Archibald on the eve of the Paris Haute Couture shows, to discuss her stunning Spring/Summer 2014 debut, her love of the performing arts, the journey of self-discovery through modelling, and her pride in representing on high fashion's gilded runways. Inoubliable Model Army (IMA): Hi Samantha, congratulations on an impressive debut at Spring/Summer 2014 collections. Have you had a chance to unwind yet and how are you feeling in the aftermath of the shows? Samantha Archibald (SA): Thank you! This season has been one of the best times in my life so far! After the shows it took a couple days for everything to really sink in, I'm still on Cloud 9 lol! It was amazing to come home to see my family and friends again and to be able to enjoy their company. IMA: As a relative newcomer, would you mind filling in IMA's audience on your backstory? SA: I'm seventeen, born in Washington D.C. but grew up in Florida. My parents are both from Jamaica and I have elders on both sides of my family from Germany, my friends say that I'm "Germaican" haha! I was discovered when I was 14 by Michele Pommier. My family and I went to Miami one day during the Summer before I entered high school and saw Michele, we signed a contract that same day. IMA: Your Spring/Summer 2014 show list included appearances at Charlotte Ronson, Karen Walker, Sister by Sibling, Giles, Carmen Marc Valvo, Andrew Gn, Maxime Simoens, Moncler Gamme Rouge, and Nina Ricci. What were your expectations going into your first show season and were you happy with the overall outcome? SA: I went in only knowing what I had seen from some backstage YouTube videos I had watched before it was actually time to dive into it for myself. I'm delighted with how things unfolded for my first season, getting my first taste of Fashion Week has only made me hungry for more! Seeing the magic of it all, waking up and putting energy into something I love everyday is a beautiful, indescribable feeling for me. IMA: What were your most memorable Spring/Summer 2014 moments both on and off the runway, and was there a particular city out of the four fashion capitals that you felt a stronger affinity to? SA: The rush and atmosphere before each show always makes me feel so alive, also getting to be a bit of a tourist and to see so much of these cities while roaming around on castings was just fantastic! I'm a sucker for architecture. One of my favourite memories was after the Moncler show when some of the models and I went out to eat and just strolled the streets. I love all four cities for different reasons, each one was like a different adventure. It would be hard to pick one over the other really but New York, Paris, London! They all have strong memories for me. IMA: You were one of the standout newcomers that IMA photographed at the Natalie Joos Casting this season. You clearly made an impression on Natalie Joos who cast you in Charlotte Ronson and Karen Walker, as well as featuring you on her personal Instagram page. What is your approach going into castings and what do you feel are the key components to impressing casting directors? SA: It felt really good to see I made an impact on Natalie, my smile was pretty much permanent after seeing the Instagram post. Going into castings, I think it's important to be true to who I am and show as much of my personality in the limited amount of time we get to show what we've got. IMA: Ethnic diversity was on the minds of casting directors for Spring/Summer 2014. Did you notice greater opportunities for models of colour this season, and how does it feel to be part of this new generation of black models who are being embraced by the industry? SA: It's great to see all of these girls from all over the world come together for the opportunity to be in shows for some of the greatest designers. I'm proud to be one of the new girls of colour on the runway, being a face that other people of colour watching can also identify with makes me proud to represent. IMA: You were a vision of serene beauty at Nina Ricci. What was it like walking for such an iconic fashion house, and did the FEMA protestors cause much of a disturbance amongst the models backstage and on the runway? SA: Thank you! I loved being a part of it, the show was just bliss, so feminine and dreamy. I had no idea about the protestors until later that night when I saw pictures of them on Instagram! I was shocked that I didn't find out sooner lol. What I saw backstage was what I assumed to be the usual hustle and bustle so didn't suspect anything out of the norm. Really just had a laugh about it later, the show must go on right?! IMA: What do you enjoy most about modelling and what are your long-term modelling aspirations? SA: Every aspect of modelling really excites me; photo shoots, runway, the design element, events, meeting so many talented people, seeing new places, the list goes on and on! I have learnt a lot about myself with all of these experiences. I want to make an impact as a model, to be on the covers of magazines, campaigns, to walk for some amazing designers, appear in innovative editorials, to basically be the best I possibly can and to see where it all takes me. IMA: A model's sense of style is of paramount importance when presenting at castings, and also due to the rise of street style photographers and bloggers. How would you describe your street style, and which designers best encapsulate your fashion aesthetic? SA: I have fashion commitment issues lol. I could dress edgy one day and urban the next, hippie this day and then sporty another. I love experimenting with clothes and different styles. Going into castings this season, I tried to stay neutral and in black. Now that I have seen that we as models can incorporate our own style more into our casting outfits, I'm excited to bring out more of my own individual style next season. IMA: What do you like to do when you are just hanging out with your buddies being a normal 17 year old? SA: When I'm home hanging with friends we hang out in the parks near our school, have movie nights, skate around the neighbourhood, anyway we hang out always provides plenty of laughs! IMA: The fashion industry is one that forces its young protégés to grow up quickly. The CFDA encourages casting directors to feature models 16 years and above on fashion's runways. What are your thoughts on this recommendation? SA: Each person is individual and is able to handle things differently like Fashion Week at varying ages, 16 seems to be a good general age so models can become more established while completing school. IMA: One of the greatest challenges of life as a model is the time spent away from family and friends. How do you counter this aspect to modelling while away from home? SA: This Fashion Week was one of the longest times I've spent away from family and friends, lots of video chatting and phone calls almost every day really made me feel at home wherever I went. Sometimes if there would be no wifi at the model's apartment, I would walk down the block looking for a cafe with wifi just to check up on them haha! Models that I have worked with, housemates, even some that I would meet at castings and go out after for team or something, all made great buds this past season. IMA: Models nowadays are encouraged to showcase other aspects of their personalities and interests to add to their overall allure. What are your personal interests and passions beyond modelling and fashion? SA: I enjoy drawing, dancing, singing, acting, pretty much anything to do with the performing arts. I'm guilty of being in the Glee and drama club at school haha ;-). I love architecture so I have a habit of building model houses out of cardboard whenever I have scraps. I also have a box of poems and short stories that I've written, any way I can get creative is welcome to me. IMA: Sound and professional management play a vital role in a model's career trajectory. How have Major Models been instrumental in guiding you through your first show season and what is the most valuable piece of advice that your agents have shared with you? SA: Walking into Major Models is such a homely feeling, everyone's really kind and makes me feel welcome. The best advice I've received was just encouragement to be myself and little details on the ins and outs of Fashion Week. SA: What makes me "Inoubliable" is that I have mixed features, a bright smile, and I'm just myself!